Announcement Welcome! Please message us with any questions and special delivery dates. Mother's Day gifts, graduation gifts and even Father's Day Gifts are being ordered now! 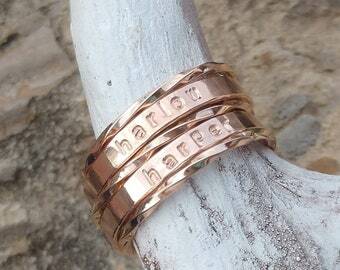 Personalized jewelry makes great gifts for her or him! 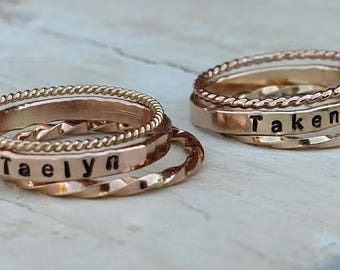 Birthday gift, Wedding gift, Anniversary gift, Religious gift, Animal lover gift, Baseball Mom gift, Baby shower gift, Mother's day gifts, Father's day gifts, these are perfect for any occasion. Give them something meaningful! Please keep in mind, all items are custom made per order. If you need your order sooner than current processing time shown on each product, currently 2-10, please message us to verify availability prior to ordering, creation times vary. Some personalized items can ship next day and some items take longer to create. 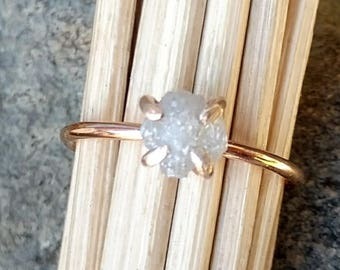 Personalized gifts, custom jewelry, stacking rings and raw, rough gemstones diamonds make wonderful, extra special gifts! 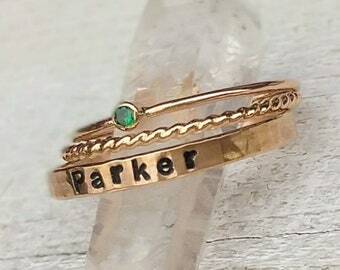 Our popular, stackable Mother's name rings and women's personalized stacking rings in sterling silver, rose gold and gold are available here in our shop as well as our fine jewelry, one of a kind, raw/rough diamonds and the new, masculine, rustic, sterling silver, men's personalized jewelry collection. Luxe, boho, minimalist; so many trending styles and unique pieces made your way. Be sure to include a good email address that you check daily in case we need to contact you. Be certain of your size if ordering rings. 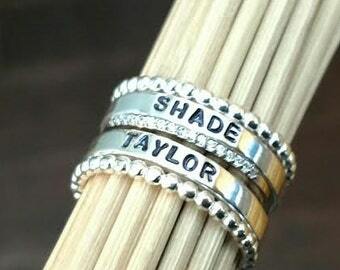 Personalized rings can not be exchanged and most can not be resized. Ella Joli is all about your greatest loves, your special moments and your fondest memories. It's personal. 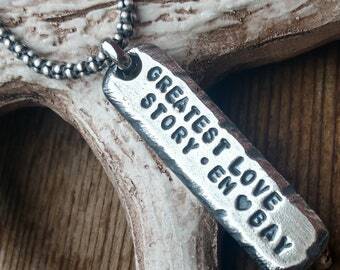 Every beautiful piece of hand crafted jewelry speaks from your heart, tells your story and displays your journey. Precious metals, natural gemstones, raw, rough diamonds, one of a kind stones and your words make each piece a timeless treasure for many years to come. Copyright/trademark/infringement laws are strictly enforced on our designs. **Find Ella Joli on Facebook, Pinterest and Instagram! We are SO glad that you're here! Be sure to favorite our page to keep up to date on new designs! Welcome! Please message us with any questions and special delivery dates. Mother's Day gifts, graduation gifts and even Father's Day Gifts are being ordered now! 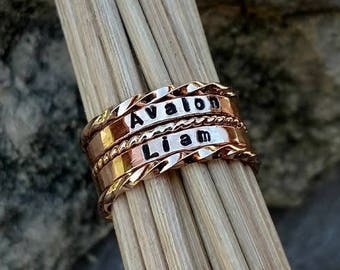 Personalized jewelry makes great gifts for her or him! Birthday gift, Wedding gift, Anniversary gift, Religious gift, Animal lover gift, Baseball Mom gift, Baby shower gift, Mother's day gifts, Father's day gifts, these are perfect for any occasion. Give them something meaningful! Please keep in mind, all items are custom made per order. If you need your order sooner than current processing time shown on each product, currently 2-10, please message us to verify availability prior to ordering, creation times vary. Some personalized items can ship next day and some items take longer to create. 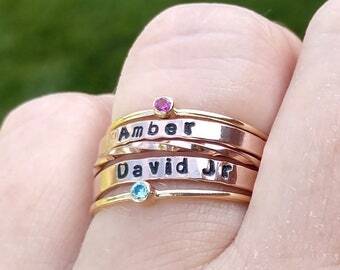 Personalized gifts, custom jewelry, stacking rings and raw, rough gemstones diamonds make wonderful, extra special gifts! 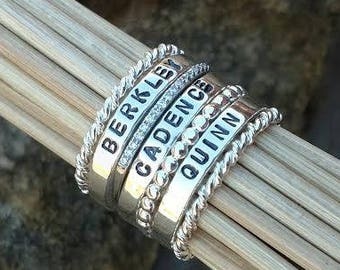 Our popular, stackable Mother's name rings and women's personalized stacking rings in sterling silver, rose gold and gold are available here in our shop as well as our fine jewelry, one of a kind, raw/rough diamonds and the new, masculine, rustic, sterling silver, men's personalized jewelry collection. Luxe, boho, minimalist; so many trending styles and unique pieces made your way. Thank you for the perfectly sized chain, shipped quiu! 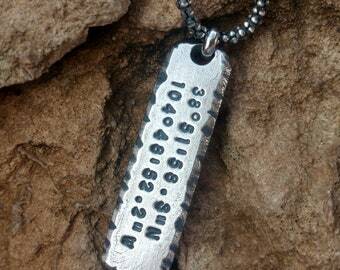 The artistry of the engraved dog tag is top-notch: the careful arrangement of text, the font, and the heft of the metal. I gave this as an anniversary gift today and it was a big hit. Ella Joli stayed in touch with me during the whole process and made astute suggestions along the way. The final product went beyond my expectation -- so beautiful. I paired it with the silver bar (engraved with our anniversary date and a heart) and the combination looks great. Very grateful for how this turned out. Looks amazing and quality is outstanding! 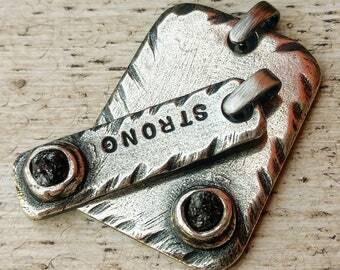 Hand carved & a load of silver, these thick, masculine necklaces are perfect for your guy! 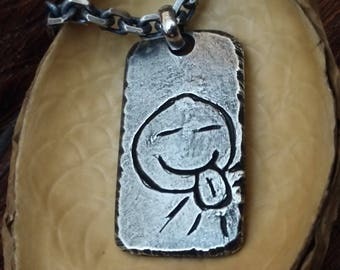 Think Christmas, birthday & anniversary gifts for him with this custom artwork pendant or a hand stamped/engraved personalized bar or dog tag in the same style. Our men's line is exceptional! These handsome, rugged and masculine coordinate, latitude/longitude location necklaces make perfect, personalized gifts for him! 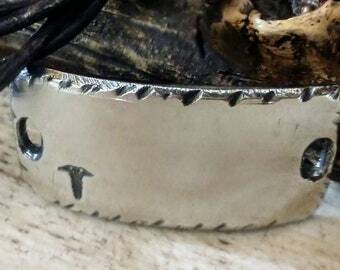 We hand carve these in sterling silver. 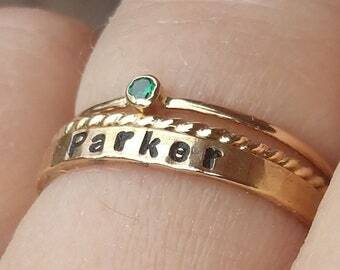 Always remember that special spot with custom jewelry! 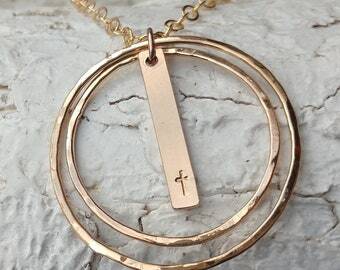 This personalized minimalist style necklace is truly beautiful & available in silver, gold, rose gold or mixed metals. Cross, heart or word can be put on personalized bar that dangles in textured floating circles. A perfect gift for so many occasions! Very detailed, delicate work! 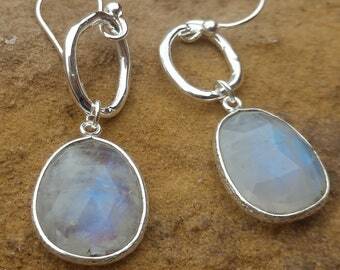 Our sterling silver jewelry designs are hand carved. Most can be personalized your way! 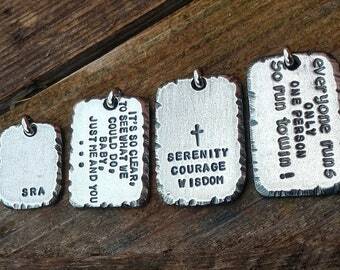 Our silver men's dog tag & bar pendants are super thick in comparison to the others. Very popular for the manly man! 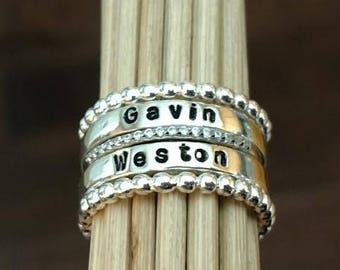 Our personalized, custom men's jewelry line is amazing! 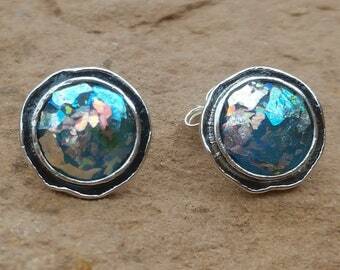 These silver pieces are being oxidized before finishing. 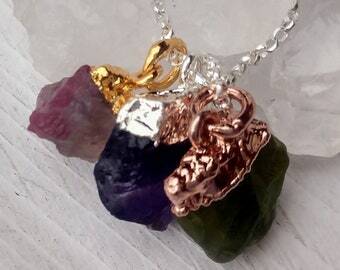 We LOVE working with rough, natural gemstones & raw diamonds! One of a kind & as unique as the woman wearing it! Shipping dept. We ship large quantities daily. Attach labels then package the orders, it takes some time! We thank you! Video summary: Christmas Eve is coming soon...Order early to receive your gifts with free standard first class USPS shipping. Our story is rather simple really. 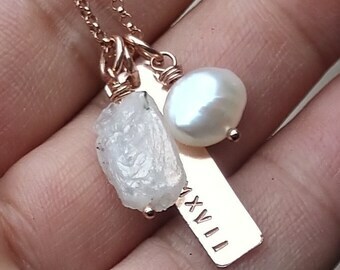 As a boutique owner and mother involved in team sports & activities with her kids, my desire to create "mom" jewelry and personalized gifts (that would be symbolic and meaningful) shifted my retail boutique store front into the desire for a brand, which, in turn, shifted my business online. We didn't actively begin showcasing on Etsy Marketplace until 2016. 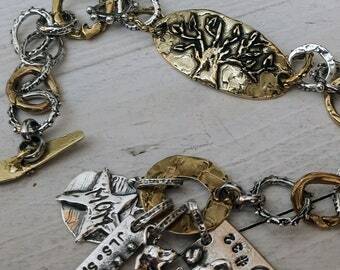 Our custom, personalized jewelry product line consists of pieces made specifically for you right here in Kansas, USA. From hand carved sterling silver and hand crafted gold, rose gold and white gold to raw, one of a kind diamonds and gemstones, we offer custom jewelry that is not precisely duplicated, After all, whether self indulging or gift giving, you want it to be special, meaningful and touch the heart of the recipient, it should be a part of a story, and you want it to last!! High quality products at competitive price combined with exceptional customer service is THE winning combination. It's not a big secret, but, so often, that's just not the case. We strive to use the best quality of components and the beauty of that difference is evident. 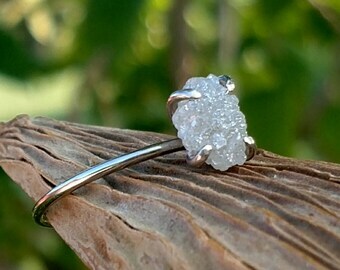 Nature is certainly an inspiration as you can see with out designs and photos in natural gemstones and organic settings. We do not edit or enhance our photos. We have added men's jewelry and children's jewelry to our very successful women's line and they are growing and expanding everyday! There's sure to be something they'll love here! Perfect gifts for every occasion! If you have any special requests, we'd love to hear them! Thank you for taking the time to check us out!! Business owner, designer and maker, mother of two. The boss's boss. =) Shipping, processing and organization as well as some artwork design and sketches for the custom pendants. Customer relations, social media and email, photography, maker. All purchases are custom made per order. Be certain of your size & input your personalization and capitalization carefully at checkout in the "notes to seller" box. For example: Emily vs EMILY vs emily. Your item will be made EXACTLY as you type it to us. Dates are separated as follows: 12.25.17 Please be sure the email address is correct in case we need to contact you! Be sure your shipping address is correct at checkout!! 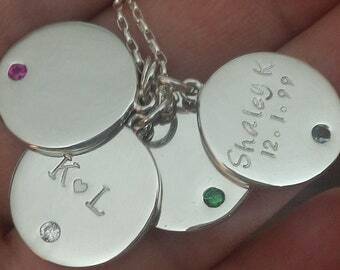 We intentionally do not use machines to engrave our jewelry. Any text or design you see is done by hand, one image at a time. Characters may not be perfectly aligned, although they will be very close as shown in our photos. 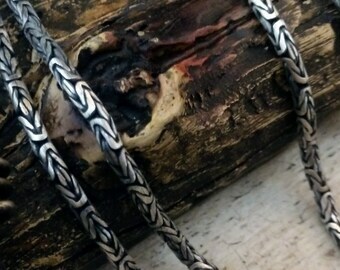 This is the nature of the product and adds character and beauty to your one of a kind jewelry. If you would like a size not shown, simply contact us. We would be happy to review your request and promptly return your message! 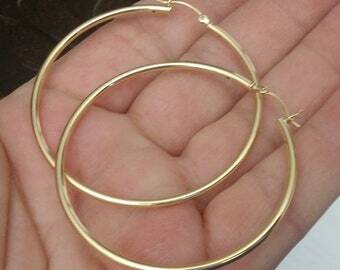 Be certain of your size as personalized, custom rings & jewelry pieces can not be returned. 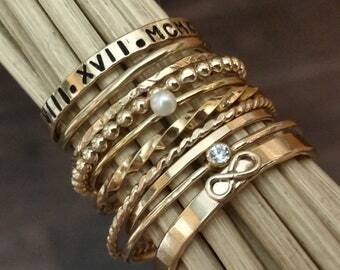 All of our jewelry is custom made just for you! For whole size only rings, you may safely purchase up 1/2 size. **Be certain of your size. 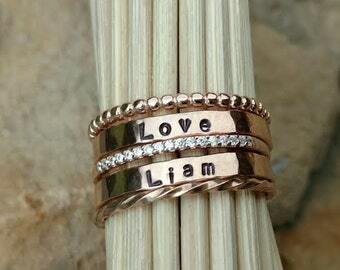 Some rings can be resized (we charge for this service) and some can not. Custom & Personalized items can NOT be exchanged. Care cards are included with your order. Our products are all easy care with a soft polishing cloth. Avoid repeated exposure to antibacterial soaps, chemicals, lotions, shampoos, hairspray, etc. Keeping them clean and storing in a protected jewelry box or airtight bag when not being worn will keep them looking their best. If you have any questions about how to care for your specific purchase, please message us! Be certain that your shipping address is correct at checkout. We can not change that information. Expedited shipping time is available but this does not speed up the time it takes to create your one of a kind purchase. See individual product details and shop announcement for the current turn around time. During times of heavy work load, including all holidays, orders may take longer to ship. Message us if you need it by a specific date prior to placing order, we'd love to comply if possible. **Standard shipping includes tracking and delivery confirmation, it does not include insurance or signature, you may request to purchase these.